Without Dalvin Cook, the Vikings run game will need to find the pop their dynamic rookie had just given them or risk fizzling out. Video (01:16) : Vikings wide receiver Michael Floyd is ready to play after serving his four-game suspension for violating the NFL's substance abuse policy. Stepping in, Latavius Murray picked up a long of 5 yards on 7 attempts in his first extended action for the Vikings. Stripped to the studs at two important positions — quarterback and running back — they still had a chance in Sunday’s 14-7 loss to the Lions. “We still had the ball on the 5-yard line with a chance to score,” tight end Kyle Rudolph said. But the offense failed them again in the closing minutes when coming up scoreless on third-and-goal from the Lions’ 3-yard line. A week ago, Cook leaped over his own offensive linemen for a goal-line touchdown against Tampa Bay. And in Sunday’s first half, the Vikings rookie sped through a huge hole, untouched, out of the shotgun for his second touchdown from 5 yards away. Cook’s elusiveness and acceleration gave the Vikings a key threat at any yard marker. He helped mesh the run and pass elements of their spread offense with big gains on the ground (5 of 20-plus) that gave defenses pause before backing off in coverage. Asked if they’ll need to change their approach without him, Zimmer started with “it shouldn’t,” before pausing. 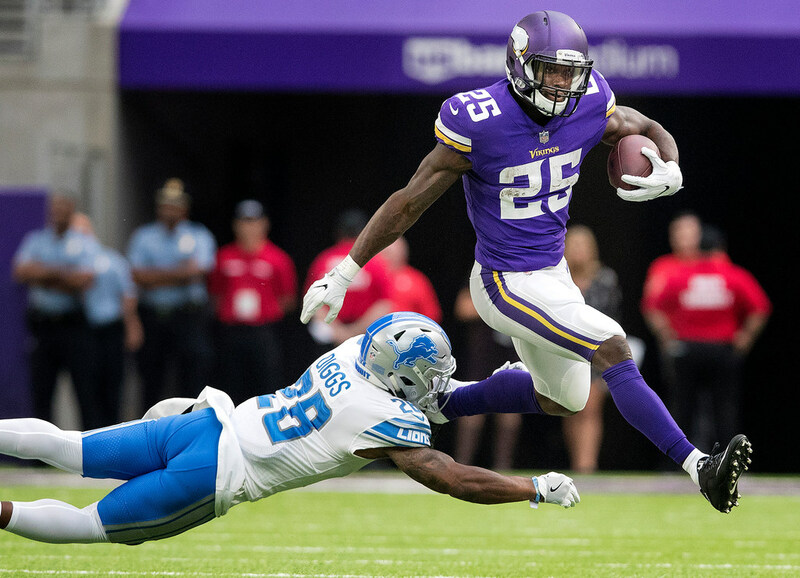 Let’s take a look at four examples of the Vikings offense with Murray, including the critical goal-line stretch down 14-7 in the closing minutes of the loss to the Lions. Here to help is Dan Hatman, a former NFL scout and Director of Scouting Development at The Scouting Academy. You can follow Dan on Twitter at @Dan_Hatman. Despite three fumbles in the second half, the Vikings had life on Sunday against the Lions. Quarterback Case Keenum made a pair of big-time throws to tight end Kyle Rudolph to get down to the Lions’ 8-yard line, trailing 14-7 in the fourth quarter. With Murray in, the Vikings roll out a heavier shotgun formation with a two-back set (including fullback C.J. Ham) instead of the lighter two-wide personnel on Cook’s 5-yard touchdown run earlier in the game. Murray, previously an avid goal-line touchdown scorer for Oakland, picks up 4 yards against a loaded Lions front. The Vikings blocked this one fairly well, although a twist from the Lions defensive tackles creates some issues once Murray cuts to the backside. The Vikings go back to a two-receiver shotgun look at the goal line, getting the 6/7-man box more ideal to run against. However, the Lions run blitz with safety Glover Quin from the slot, which causes apparent confusion between left tackle Riley Reiff and left guard Nick Easton. Defensive end Ezekiel Ansah comes untouched to wrap up Murray for 1 yard. “Reiff clearly believes he has someone inside to pick up the B-gap player [Ansah] as he shifts his attention to the blitzer coming [Quin],” Hatman said. A play after Quin blitzed from the slot, the Lions DB tricked the Vikings again. This time, Keenum said he adjusted protection before the snap, which leaves a free runner on the opposite side (right tackle) to thwart this critical third-and-goal from the Lions’ 3. Keenum doesn’t throw it away, making the fourth-and-goal nearly unmanageable. Our Mark Craig broke this play down right after the game. Also note after Cook went down, Murray played almost exclusively on first and second downs with Jerick McKinnon (in on this play) and C.J. Ham seeing third-down snaps. That could always change, however. Without Cook, you might see fewer perimeter runs given Murray’s strength and size. Here, the Vikings run another inside-zone run with Murray, which produces his longest gain of the game. Tight ends Kyle Rudolph and David Morgan create an opening on the back side, but Hatman notes right tackle Mike Remmers surrendering ground, which closes the front side.